This is intended to be a general discussion of MSR. MSR is mentioned under many different subjects on this forum, and some posts go into details. This will allow general discussion of MSR and I would like to start with a discussion of Why a MSR Mission, and also Why Not MSR if you wish. After we get the opportunity to provide opinions on the merits of MSR, I would like to shift to sample size and location. I see that often this is a first consideration, and then people tend to work backward from there. Finally, perhaps we can discuss specific missions and maybe in some detail. These could be past, present, and your own concepts. BTW, I'm presently doing research on past concepts to gain some historical perspective on this subject. I would not normally participate in this type of topic, but there is this, which perhaps you have not studied yet. I think it makes sense to do this one before investing in robotic return from surface landed equipment. Perhaps they can find indicators pro or con for life. Hopefully they know what they are doing about sterilization. That's all the participation I am likely to do on this. Good luck with your research. Thanks for posting a new topic, one which is sure to be somewhat controversial. I'll begin by stating my position (opinion!) regards the proposed Mars Sample Return Mission. This was one of the topics discussed at the last Mars Society chapter meetings in Boulder. As currently designed, it's overly complex, and with minimal scientific return for the dollars being expended by NASA. It seems that every time there's a mission, every group at NASA wants to be part of the Big Christmas Tree and hang their ornament on it. What I've seen, there are lots of samples they want to return, but keeping them separated and without cross-contamination is the real problem. And then--getting them back! The cost of this mission is going to hit $2 Billion, and sample collection and caching is going to delay things until 2022 if they don't get these problems resolved SOON! There's now talk of flying the mission minus the sample collection and return cache. Quite - a complete waste of time, money and effort. Once we have a permanent colony on Mars there will be no shortage of sample return options. That $2 billion should simply be used to back Space X - but as you rightly identify there are so many competing interests within NASA, that could never happen. Doing the mission using a technology platform which is hopefully a scaleable method we still will need to be able to prove that it is safe for man to be there as we have life signs all over mars and thats not even including meteorites that have landed here with signs of possible past life. I see the samples as a variety of sizes and shapes which will try and target possible clues for life signs. They will also target mineral content and possibly even precious stone. Factors that we have to deal with is what can we return with the designs that we can create based off from what we can land. meteorites come from Mars to Earth. They must also have gone the other way. Mars has already been exposed to Earth rocks! The "dusty catcher's mitt" mission is interesting. I recall the stardust mission. The main problem is that many scientists particularly geologists like to have context information for samples. Anyway, the article is from 2014; have they received any funding for this proposed mission to date? Yes, this MSR subject sounds like it's going to be controversial which kind of surprises me. I thought the majority would indicate support. However, this is interesting in itself. If I would have posted to some other space exploration forum, you would expect people to say that robotic missions where far superior to human missions because humans are fragile and 'needy', that is, we require lots to exist in our comfort zone. But, within the context of a Mars Society forum, the big question is whether a MSR mission would help or hinder the goal of humans on Mars. I understand why there would be resistance. We received the first lunar samples from Apollo, haven't got any more samples, and the Moon is a lot closer. Again, interesting; what seems to be a totally anthropocentric view of studying and using Mars. Think about it; terraforming a planet is probably the opposite of planetary protection. But, there's another subject thread on terraforming I think, and we want to stay on topic. Yes, NASA has problems with the execution of missions. There are problems with NASA centers cooperating and not being territorial. And, everyone seems to always want a piece of the pie. So, I wonder how much cooperation SpaceX is really going to get when it comes to things like unmanned/robotic missions. Even if it does speed things along and cost less. So, continuing the topic specific, MSR or no MSR, I believe that at unmanned sample return would be a good use of time and money. It has the potential of yielding profound results. It would prove concepts, and demonstrate that the technology exists to return from Mars; even if it's some soil or water samples. People talk of 250 gram total sample return; one person weighs a lot more than that! It would provide the opportunity to test concepts for future human missions and perhaps identify things that would be very useful to development on Mars. I believe that the results, even if it doesn't prove life did or does exist, would encourage funding (and the necessary will) for human missions. I remember the old decontaimination trailers that the apollo astronauts had to go into after the capsule was hauled onboard the carriers that picked up them after there return. The samples were also treated the same way until much later. We also brought back some insulation from a surveyer lander and found that sheltered from the exposure of the solar events that a bacteria had survived for 20 years. I suspect that mars as well may have protected areas that early life did catch hold and did survive. Whether this be cross contamination or other does not matter. The question will be if found, what precautains do we need to take until tested for safety? I kind of wanted to focus on the MSL vs no MSL thing first, then move on to samples, but perhaps that wasn't practical. Still interested in what others think about the merits of even having a unmanned MSR mission. Planetary protection and sample safety could be a subject of its own, because it can be complicated and controversial. Keep in mind that probe missions to Mars are aimed to miss Mars and only make the correction for final entry later. The subject of Mars protection is going to be big. For example, SpaceX has that moto of Occupy Mars. Even a little militant sounding. Employees of JPL would be wearing shirts that say Study Mars. Anyway, there's an obvious difference in opinion. Almost exploration vs. exploitation. Maybe we should know more before sending humans, and this would be a good argument for my position on having a MSR and maybe several missions first. Find a good location to start a human base and determine the levels of protection. Anyway, in my opinion, no samples should be directly returned to Earth from Mars. Just look at what happened to the Genesis spacecraft. For me, it's the importance of preserving the valuable (and expensive) samples. Also, you must consider the possibility of some dangerous microbe - there's uncertainty. All samples should be placed in Earth orbit, retrieved and maybe delivered to a sample module on the ISS for study. Then, lots could be delivered on return crewed flights and further processed at laboratories on Earth. Same goes for lunar samples. Some MSR particulars were discussed on the New Red Dragon subject, and I also see MSR comments many other places like the 2020 thread. I believe that surface samples might be valuable, but perhaps from many different locations over Mars. Presently, a remote rover has very limited range capabilities. Maybe it's the transmit times, or perhaps just because of a lack of trust in AI capabilities. There are images I've seen with the tracks of the later Apollo missions compared to Mars missions like MER. It really shows that human exploration goes much farther/quicker. Remember with the premature end to the Apollo program, many people thought we didn't need additional lunar samples and the ones already collected would keep us busy enough? Later, we understood that there was a lot more to learn. The Moon is a big place; Mars is a big place. Just the permanently shadowed craters of the Moon would be great places to explore and collect samples. And, there has been a lot of work already done on drilling Lunar core samples. I recall receiving regolith simulant samples from NASA Ames like 10 years ago that they were using to develop drilling techniques. So, I believe that MSR would be a good idea, but I think it should not be a two mission project like 2020 with a different lander-MSR vehicle, and instead an in-place drilling of core samples to a depth greater than 3 meters. We could go a lot deeper btw, and the Moon would be an excellent location to test drilling and returning samples. Mars 20 2-whatever should identify the best place within it's range to collect core samples and deploy a transponder at the location for a later MSR mission. And, hopefully, not a lot later! Just my humble opinion: W/r Mars, we've really reached a point of diminishing returns using robotics. Just bring back what samples we can scratch our of the surface will not conclusively confirm or deny the presence of life forms, past or present. I've had this argument with my friend at Lawrence Livermore National labs; he's a really big supporter of continued robotic exploration in place of "boots on the ground." I've simply known too many geologists who state that what we are looking to find requires a human on the scene. The $2 Billion spent on tis single aspect of MSR could go a very long way if used to fund SpaceX's attempts to land on Mars by 2025. I also believe that deep samples from core drilling are the only justifiable mission I could/would support--but it ain't happening any time soon. Fair enough, I appreciate the opinions. I'll probably think the MSR subject over a bit and come back to it. Hopefully, we'll see some opinions from different people too. 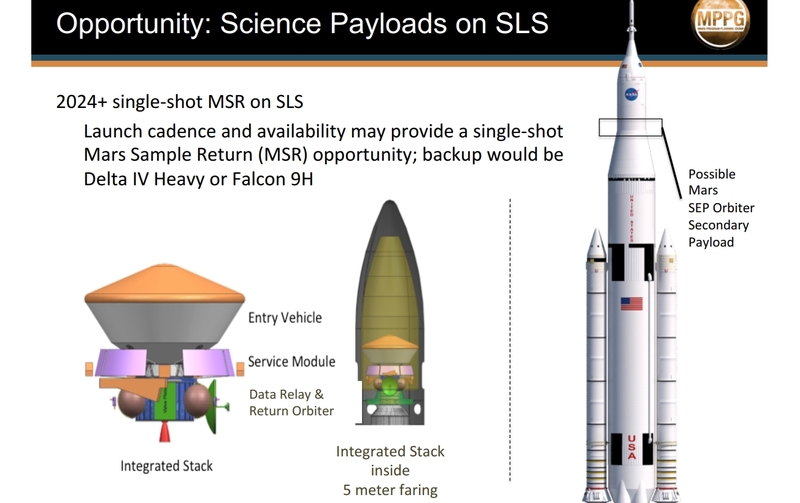 Again, a unmanned MSR mission might be a difficult sell to most Mars Society and SpaceX fans. Sometimes, I think that the science isn't important to many people, and they might suggest the advantages of human exploration of Mars for scientific studies as kind of a selling point more than scientific interest. I mean, what's the real goal; exploration/science, or just getting humans on Mars? Is it just an engineering endeavor? If you really think that Mars study isn't that important, you may want to start saying that now. With technological advances within the next 20 years, exploration of the solar system is going to be fine without humans going along. For me, I honestly admit having humans go to Mars is not mostly about science. I'm interested in scientific study, but getting humans to Mars and it's scientific study are two different objectives. I'm not so optimistic about the timelines I hear for 'boots on the ground.' I could see an orbital recon mission with sample return in about a 5 year timeframe. Say, two people with control over landing probes, drilling (I hope), and return of the samples. Even this would take substantial will and funding. I just don't see SpaceX paying the whole bill and doing aggressive things without the support of the federal government and NASA. I find that the robotics when done with enough places are capable of selecting and optimizing the places that man can best survive from the get go but due to the slow rate and not so many places being seen then we are not getting the return for the investment that we desire and now we are limited to possibly less than survivability for where we go. Proper planning says that no matter what we know we need to preload the selected site with plenty of goods for use so to enhance the chances of surviving even if we did not choose the correct place to land. I'm not being deliberately negative, but living in what's called "the oil patch" states, I've seen what it takes to drill a meaningful "hole in the ground." Core drilling units are smaller, as are water well drilling rigs. We just don't have the payload capacity at this point in time to get the job done. A serious rig could weigh in at least 5 tons, if not double that. Doing that sort of drilling also requires water, and lots of it. That makes 2 things we can't get to Mars that soon. Scientifically, I'd love to see several hundred linear feet of Martian core samples placed in the hands of a good geologist. In a well equipped laboratory, and not have the dregs tossed into a 250 gram sample return mission. .. this just in..... Planetary Protection "Presumptions"
This is what happens when "intellectualism" takes control. And Dr. Zubrin hits the nail on their head for good reason. Small rigs are available as helicopter portables. They wont drill to 250 metres but such a thing would give useful subsurface data. There was a rig designed by Canadians. Robert Dyck posted about it previously. That programme could be resurrected. For efficiency I would like to ship a couple of geologists and a lab and a rig to Mars, rather than attempting to return tiny samples only to find that you should have drilled somewhere else. payload of the FH as high a 10 mT, the rovers and equipment that could be transported could be 4.5 mT above the 5.5 mT fueled weight of the cargo Dragon. But according to the delta-v chart we still need 0.5 km/s delta-v to land on Phobos. The cargo Dragon has a delta-v capability of about 600 m/s with its Draco thrusters for the Dragon capsule alone. The possible cargo carried by the Dragon being as high as 4.5 mT suggests though we should try to make use of that cargo space. One possibility would be the processing equipment to produce ISRU (in situ resource utilization) propellant. Perhaps a rocket to do a sample return. Possibly orbiting imaging spacecraft for Phobos or Mars. There was a two page briefing on the Red Dragon concept in 2012. In the link from texas U page 18 is the 3 launch Atlas v design to accoumplish the sample return. Terminal Landing Phase as a constant descent rate of 3 m/s. Of course the JPL was pitching a Red Dragon landing to set the stage but we know thats not happenings. I can only comment that this is completely pathetic in the context of Space X's mission to Mars. I think a lot of missions will just be cancelled once Space X get there. As I have stated in the past--when NASA finally gets there they can stay in the Trump Towers in Muskville.